A whole year of Social lies ahead and the plotting has already begunâ€¦ pop these dates in your diaries for upcoming the Club Colours Social Run and gatherings not to be missed. Wednesday 6th February. The Cuckfield, Wanstead. Wednesday 6th March. Manor House, Wanstead. Wednesday 3rd April. Wanstead & Snaresbrook Cricket Club. Wednesday 1st May. North Star, Leytonstone. Saturday 11 May 2019. Venue will be confirmed. Wednesday 6th September. Venue confirmed nearer the time. Updates are via Newsletter and nudge reminders posted on our Facebook page. Tickets £20 and with only 120 available, it will be a first come first served basis. So do not delay and transfer today to be part of ELRs Festive Fun & Frivolity. The ELR Awards Panel met recently with the difficult task of producing a shortlist in each category for our Club's main running awards. There were many contenders and this year it was decided to list the top six in each category from whom the winners will be selected. 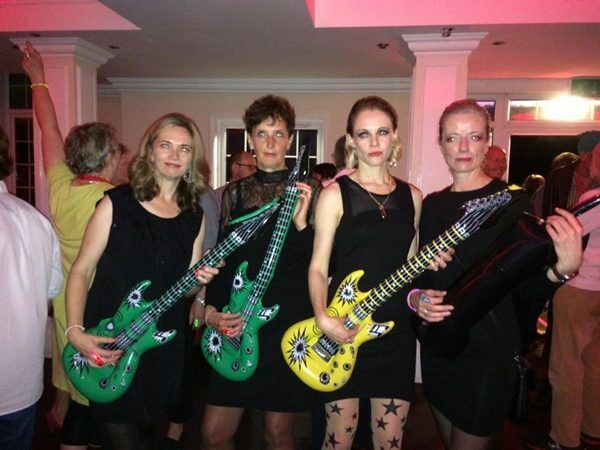 The victor and victoress in each category will be announced at the party on 13 December at The Wanstead Cricket Club. The Nominees are listed alphabetically by surname below. The last one of the year sees us return to another ELR favourite, where comfy leather sofas and Conway Corner await our arrival. With a punctual 7:15pm departure from Wanstead Leisure Centre you will be guided in your 'pace groups' directly to The Manor House. Donâ€™t fancy the run? Then come and join us anyway for a festive drink and final CCSR catch up for 2018. REMEMBER, CCSR is now BAGGAGE FREE!!! Lockers are available for a returnable £1 and can be found on the first floor landing and in both the Male and Female upstairs changing roomsâ€¦ pub goers please note, the Leisure Centre closes at 10:30pm for retrieval of your belongingsâ€¦ and for those who might get a little carried away, reopens at 6am. Safe running in winter requires plenty of illumination, please make sure you can be seen, HiViz, Reflector wear, flashing lights, the more the merrier, and remember to don your Colours. The big night is nearly upon us!!! Limited tickets remain and by the time you read this the Party could be a total SELL OUTâ€¦ we understand these things can be rather organic. If you are desperate to be a part of the action, drop me a line and I will add you to the waiting list. East End Road Runners will be hosting the end of series awards night and the details are below. All ELR members are invited and I encourage you to come along and support the evening. This venue has been chosen because of its excellent location. It's a 30 seconds walk from Forest Gate Station and 1 minute from Wanstead Park Station. This puts it within very easy reach of Ilford, Romford, Harold Wood and Central London via TFL rail and Barking and Leytonstone via the Overground. Wednesday 17th October 2018 after the club run. Cross Country Talk at the Manor House pub, Wanstead. Looking for advice on which type of shoe to wear for the Winter League season.....trail, stud, spike or road trainers? As an introduction to Cross Country, Grant Conway will be giving a demonstration of the different types of shoes available and those most appropriate for cross country, trail and off road surfaces. This informative talk will take place after the club run at the Manor House pub, 129 High Street, Wanstead. Please join us for a chat and a drink after the club run next Wednesday. The run's shorter and the reason is what? But BIRTHDAYS should never be forgot." We're celebrating our 36th Birthday this September and to mark this special occasion CCSR invites you to join us post run for an 'End of Summer Barbeque' and catch up at The Wanstead & Snaresbrook Cricket Club. With a punctual 7:15pm departure from Wanstead Leisure Centre you will be guided in your 'pace groups' on a slightly shorter route and directly to the fabulous grounds and surrounds of one of our closest neighbours the Wanstead Cricket Club, where the coals will be lit and a BBQ in full swing, serving up 'dogs' of the hot variety for our carnivores, veggies and vegans. Don't fancy the run? Then come and join us anyway for a cold drink, a hot sausage and catch up with fellow members. CCSR is now BAGGAGE FREE so travel independently, pack light, bring your appetite, a little money for the bar and remember to don your Club Colours. A final note, the Cricket Club has a car park, so for those who might want to deploy their 'taxi' ready for the journey home them please feel free to park up and jog down Langley Drive to meet as usualâ€¦ the entrance to the Cricket Club Car Park can be found through a small gap in the fence where St Marys Ave, Langley Drive and Overton Drive meetâ€¦ just before the width restriction barriers. For those who like to be in the know and to help you get organised, jot these dates in your diary for the upcoming Club Colours Social Runs. (a week later than usual) The George, 159 High St, Wanstead. East London Runners will be celebrating their 36th Birthday this September. 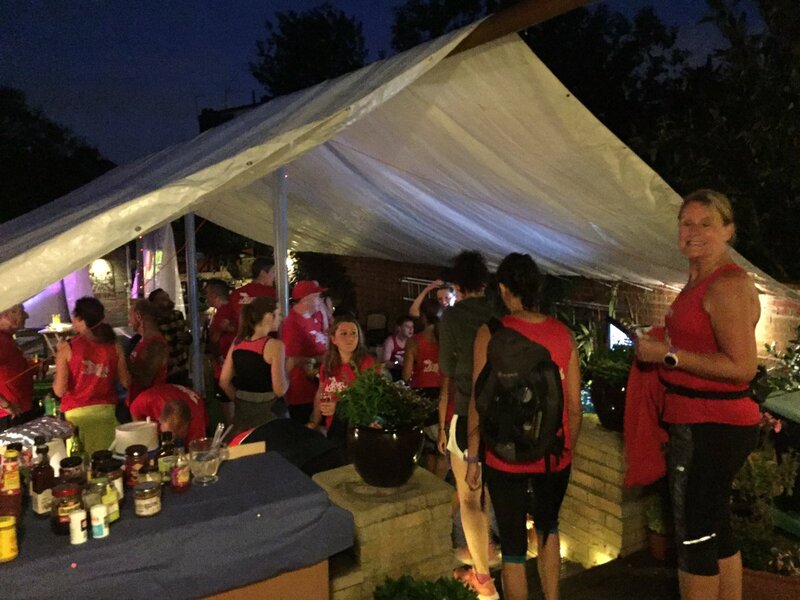 To mark this special occasion 'Club Colours Social Run' will be hosting a post run 'End of Summer Barbeque' and catch up at The Wanstead & Snaresbrook Cricket Club, 1 Overton Drive, Wanstead, E11 2LW on Wednesday 5th September at 8pm'sh. With a punctual 7;15pm departure from Wanstead Leisure Centre you will be guided by your 'pace leader' on a slightly shorter route and directly to the fabulous grounds and surrounds of one of our closest neighbours the Wanstead Cricket Club. If you haven't already fallen upon this tranquil spot then you're in for a real treat. Don't fancy the run, or injured? Then come and join us anyway for a cold drink, a hot sausage and catch up with fellow members. We'll be catering for meat lovers, vegetarians and vegans too. Food is free, pay for your own drinks! CCSR is now BAGGAGE FREE so travel independently, pack light, bring your appetite, a little money for the bar and remember to don your Colours. This month we're giving Social the whole 9 yards with three opportunities planned for gatherings and catch up's. 1. 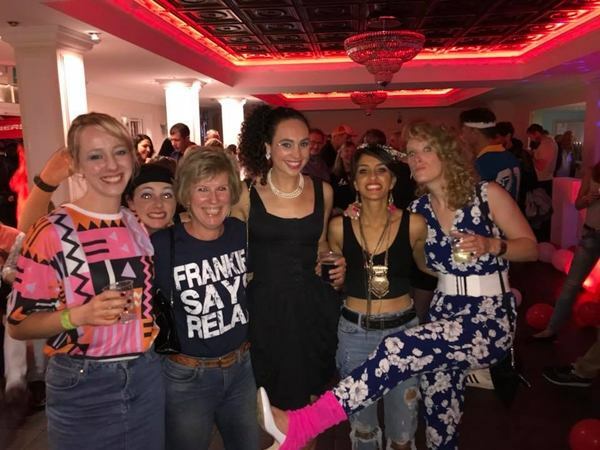 Club Colours Social Run - Wednesday 4th April 2018 - The George, Wanstead. Following our usual 7:15pm departure from Wanstead Leisure Centre a slightly shorter route will take us directly to The Georges' upstairs bar. Remember; sport Hi-Viz, travel light, bring your spends and don your Colours. 2. London Marathon 2018 - Sunday 22rd April 2018 - Post Race Drinks - The Ship & Shovell, Charing Cross. Sprint, stagger, shuffle or saunter the last half-mile of the day. Whether running or volunteering, come and join us for the day's tales and refreshments at: Ship and Shovel Pub, 1-3 Craven Passage, Charing Cross, London, WC2N 5PH. 3. - A Marathon of Medals - Saturday 28th April 2018 - Bring your Bling!!!! - The North Star, Leytonstone. To celebrate 365 days of perspiration we're hosting a relaxed, low-key evening at one of ELR's favourite watering holes, in honour of every cumulative 'running' step ELR achieved last year. The North Star, 24 Browning Rd, Leytonstone, E11 3AR - 7pm till Close. Whether it's your first parkrun; a tentative 5k; Bonkers Beachy Head, Full or Half; On or Off road, every step counts and deserves to be celebrated. So gather up your medals, pop on your favourite finishers 'T' and we'll see you down at The North Star! Around 100 ELR Members and partners attended the Annual Christmas Party expertly organised by Social Secretary Sonia Cheadle and fellow Committee Member Jennifer Ansell with Don Bennett also involved on the ticketing and financial side. We also welcomed Sally Dixon, daughter of the late Roger Dixon, and her partner Adam to our event as guests of the Club. Sally very kindly presented the new Roger Dixon Shield to Sonia who was voted by the Club Members as the Club Person of the Year for 2017. This was in recognition of Sonia's sterling efforts throughout the year as our Social Secretary, particularly in establishing and organising our monthly social runs as well as the very successful 35th Anniversary Party in September. Female Club Runner of the Year - Alexandra Rutishauser-Perera. Our winner is a woman who has an effervescent character to match her plethora of PBs that she achieved this year. Her enthusiasm for running appears unstoppable, and is equally motivating to others as she is to focusing on her own objectives. 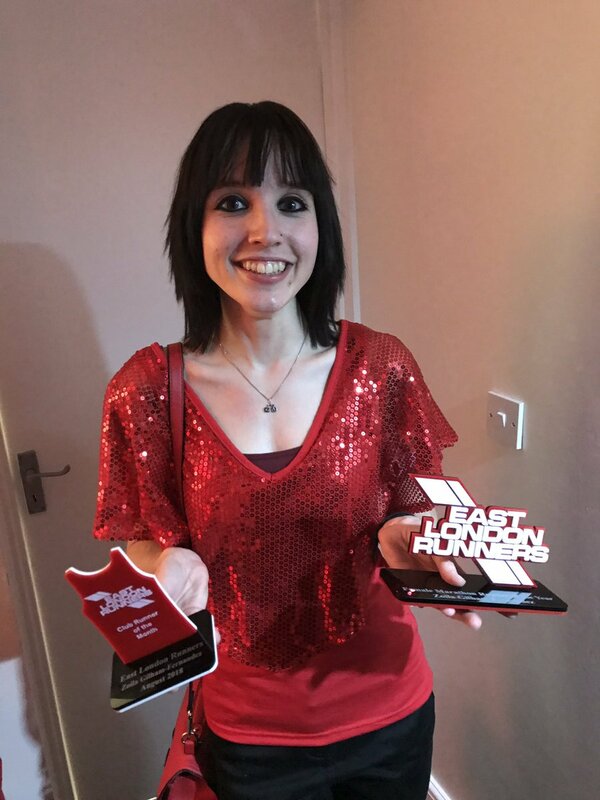 Club runner of the month for August, this person knocked 9 minutes off her half marathon PB, ran the beachy head marathon and continues to chip away at her shorter race times regularly achieving a new personal best. Male Club Runner of the Year - Michael Bamford. If there was a duathlon award this person would certainly be our winner. Always stepping up to help others, support the club in volunteering and assisting with organizing on club nights. 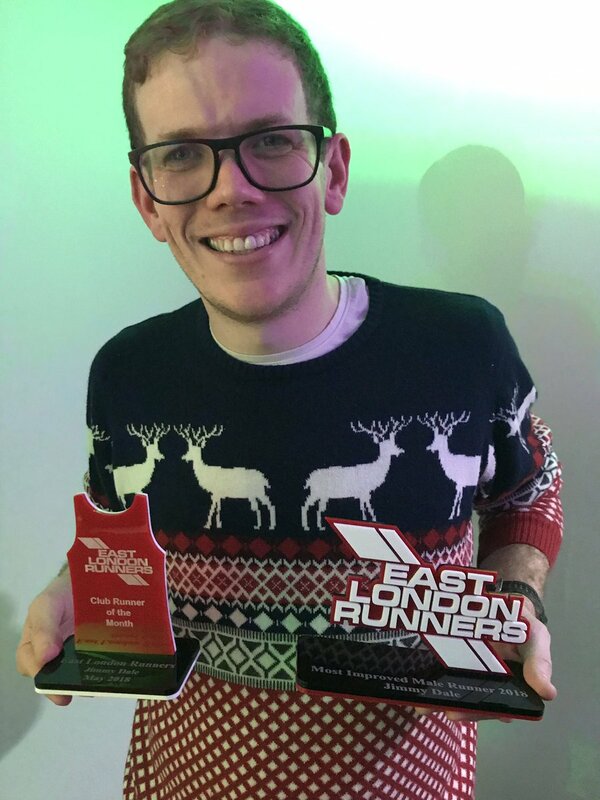 He ran in the Essex way relay (and was so fast he did not get recorded), and loved it so much he's going to organize a team for 2018! This prize is so well deserved, already achieving CROTM in October 2017. He is really not bad. Most Improved Female Runner of the Year - Emily Clarke. 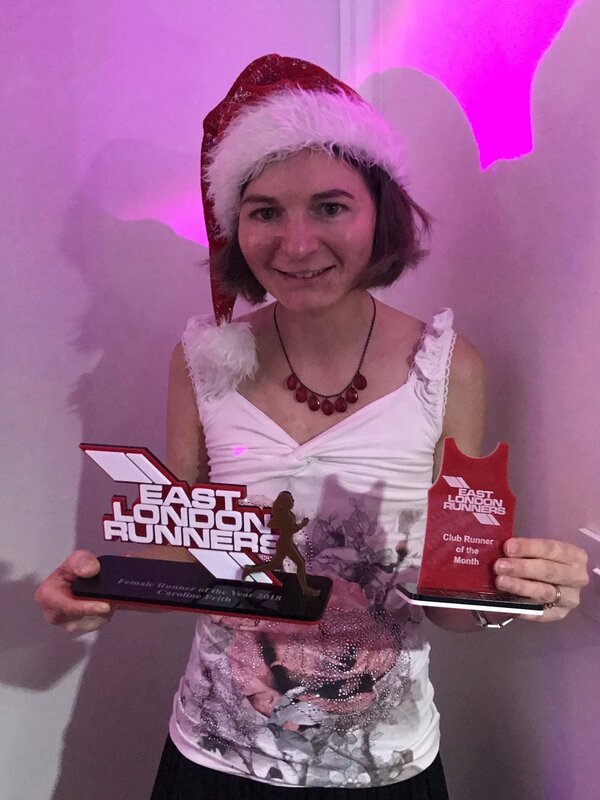 Your winner started the year with a PB at Roding Valley, was a Colworth debutant in 2017, this person has now taken up running over obstacles too. They completed 2016 with an 5K age grade of 70.34%, and this year achieved, so far 74.29%. 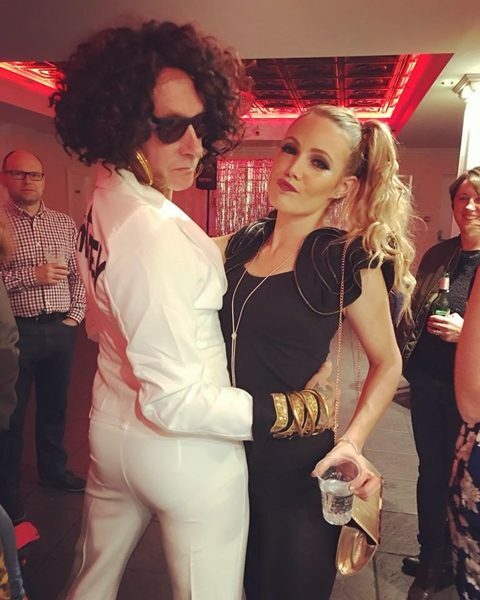 She's funny, bubbly, outrageously fun to be around. You have to go back to February to find this CROTM. Your most improved female runner of the year is Emily Clarke. Exceeding his 2016 5K age grade way back in January and matching it again last month, he's been consistently improving throughout â€“ scoring for the club at ELVIS. They completed a marathon debut this year in 3.07, not afraid of giving it everything at triathlon, duathlon and even obstacles. This person is described as articulate, talented, but better known to his friends as a different name â€“ party Dan. 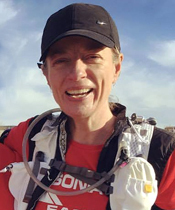 Female Marathon Runner of the Year - Suzanne Bench. This person has been a member of the club for 10 years. A friendly face at any event, she always has time to talk. Completed in 3 London marathons in that time. In preparation she took part in Benfleet 15 and Orion 15 races amongst others. 2017 3.44.57 and went on to a fourth marathon â€“ The Robin Hood Marathon a few months later. 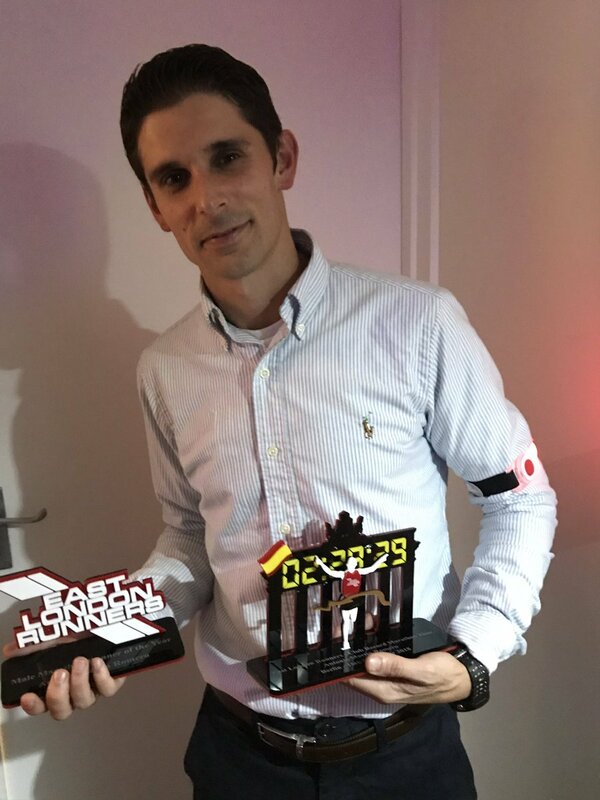 A proud member and great ambassador for the Club, who was celebrated in March 2017 with CROTM. Your female marathon runner of the year Suzanne Bench. Male Marathon Runner of the Year - Andy Bolderstone. Competing in several marathons so far this year, this marathon man has PB'd in 3 out of four of them. A charming, consistent, and determined runner who enjoys his overseas marathons along with the family holidayw- achieving 4.40, 4.38, 4.56, 4.33 in each of them. Very humble and a quiet, unassuming man who every one hears, he was your CROTM in September 2017. And now he is male marathon runner of the year Andy Bolderstone. Track Stars of 2017 - Kathryn Hertzberg and Marc Akers. The Club Runners of the Month for 2017 were also recognised for their achievements throughout the Year and presented with a 2018 ELR Calendar displaying their photos for the relevant months of 2017. Our Calendar Girls and Boys with Jonathan! 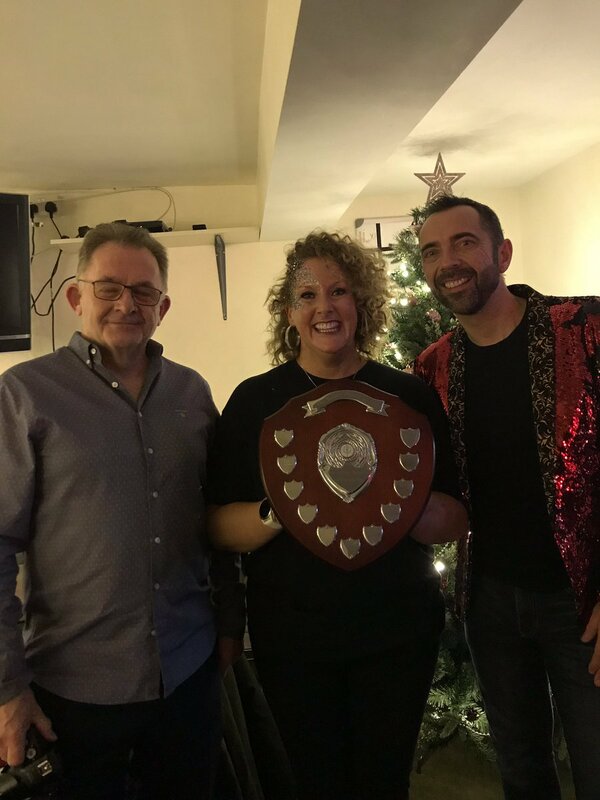 The ELVIS Captains Ava and Paul plus the Committee Members were also praised by Club Chair Frank who had commented in his opening remarks that 2017 had been another very successful year for the Club. Friday 17th November 2017 - The Awards Committee met recently with the difficult task of producing a shortlist in each category for our Club's main Running Awards. 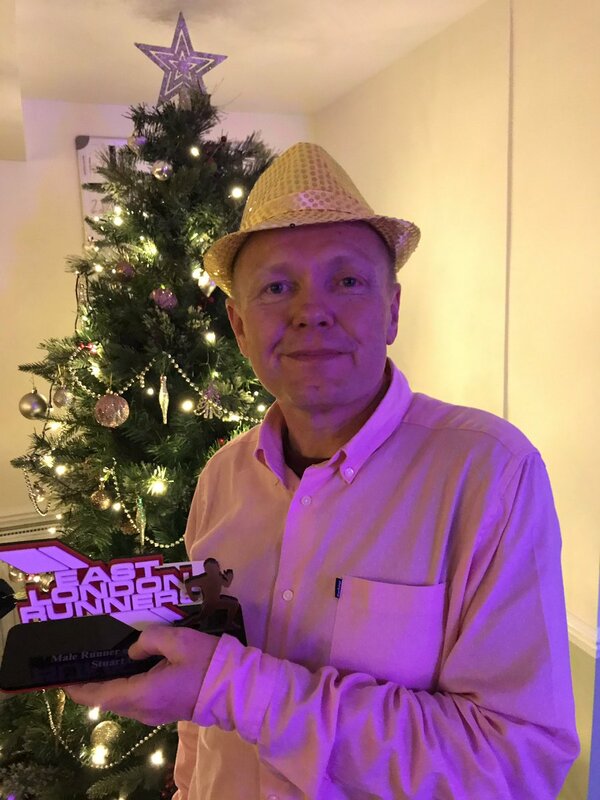 There were many contenders and this year it was decided to list the top seven in each category from whom the winners will be selected and announced at the Party on December 14th at The Birds in Leytonstone. Many ELR Members, some who had joined the Club in the 1980's and 1990's gathered together with current day members, partners, friends and guests from Leyton Sports Massage(Katherine), LFB (Narinder) and Colworth Striders (Trevor) to celebrate the 35th Anniversary of the founding of East London Runners in May 1982. The Venue was the Wanstead Sports Club in Blake Hall Road and Social secretary Sonia together with her Party Planning team of Ciaran, Jenny, Ellie and Lance with on the day help from Don and Jonathan set about the transformation of the grounds and Hall. Inside the hall the giant 1982 letters featured and together with the red and white balloons the glittering backdrop and subdued lighting all was set for a great night. Outside the ELR Gazebo and two windflags were added to great effect. Guests enjoyed Paella which was cooked on site in a pop up restaurant just outside the front door by Spanish Labs and later in the evening with ice creams. Chair Frank Brownlie said a few words of greeting to all who attended and remarked that it was due to the loyalty and dedication of many members during the past 35 years that we were today thriving successfully. Frank also spoke in fond memory of Roger Dixon, Life Member and Treasurer of ELR who had many, many friends within the Club over the past 30 years but who had tragically passed away while on holiday on 13th September 2017. Following Awards for those members who had completed races in the past year in a time of 35 minutes approx and a very successful raffle the music was turned up and the party really started and with the Bar open until 12.30am a good time was had by all! Wednesday 6th September 2017 - John Atkinson's 75 Birthday Celebrations. Following the Club runs approximately 40 Club Members gathered in John's back garden at his home which is close to our base of Wanstead Leisure Centre. 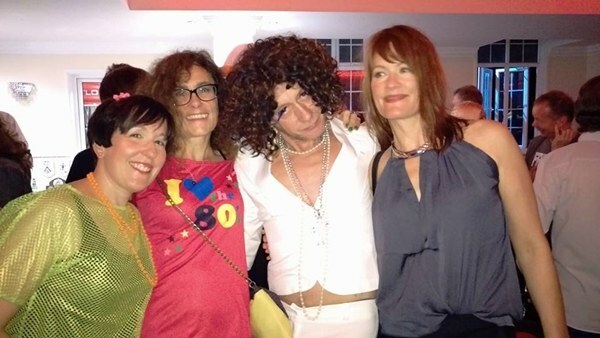 John hosted a similar event in 2012 on the occasion of his 70th birthday. Once again Club Members were treated to lots of food and drink. It was also an occasion to get together with each other and meet some new faces from the Club. There was also a very special Birthday cake expertly made by Club Member Jo Wood. Don, John, Ava and an old friend at the party. Message from ELR Social Secretary, Sonia Cheadle. On Wednesday 5th April 2017 we will be holding our first monthly 'Club Colours Social Run' and maybe shortening the route a touch but extending the evening so that we can celebrate all things ELR at a nominated local hostelry. So, put the date in your diary and come and join us for a post run drink and catch up on the 5th April at The Red Lion, Leytonstone, E11 3AA and remember to don your Colours. Join other fellow Club members after the Club run for a Social drink and perhaps some food upstairs at The George, Wanstead. Anytime between 8.30pm and 11pm.